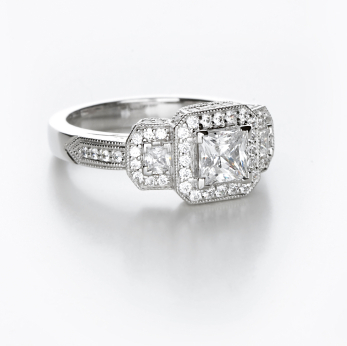 If you want to add a little extra glamor to your fiancee’s engagement ring, consider purchasing a pave engagement ring. This type of engagement ring setting is a unique style in which diamonds are encrusted along the surface of the ring band so it looks like there is no metal on the ring at all. These beautiful engagement rings allow for the diamonds to shine to their full potential, making the ring sparkle in every way. But don’t worry, these pave style engagement rings can still fit into your budget, no matter how big or small. You can still enjoy the glamor and shine of these lovely rings without breaking the bank. There are several different styles of pave engagement rings. One way to go is to buy a ring with a single row of diamonds around a center stone in the middle. By using small beads or prongs to hold the diamonds in place, jewelers eliminate the sight of metal when looking at the ring itself. It simply looks like the diamonds are floating in thin air, supported only by their contact with neighboring diamonds on the band. Another pave ring style is a bit more complicated. Some choose to purchase rings that have several rows of diamonds around the center stone, making the ring larger and more reflective. The band appears to be made of solid diamonds, adding a beautiful touch to the engagement ring that every woman will love. Sometimes, this style is used in men’s engagement rings or wedding bands without the center stone. This proves to be just as charming and this style is a perfect way to express your love for one another. The pave engagement ring can also be used without a center stone if desired, creating a lovely band of diamonds for the bride-to-be. Some women opt for the half-pave, with diamonds covering only the top part of the ring for comfort. Others choose to go the extra mile and purchase a full-pave, but this is simply a matter of personal choice. If you are worried about the cost of such a diamond-filled engagement ring, there is nothing to worry about. These beautiful rings are just as affordable as any other engagement ring. This is mainly because the smaller stones used in pave engagement rings do not have to be as high quality as the larger stones. This does not mean that you will get a shabby diamond ring. It simply means that the individual diamonds are less readily visible, and details in smaller stones are hard to see. If a ring only has one center stone, then that stone must be of very high quality to have much value. But with the pave setting, the diamonds can be smaller and of lesser definition because they share the stage with so many other diamonds on the band. The collective shine of all the diamonds together is what is so attractive about a pave ring, so there is no need to worry about receiving poor quality diamonds. In fact, this might even be a money-saver in some cases, especially if you choose to not have a center stone on your bride’s engagement ring. However, for those who wish to spend a little more, there are definitely intricate styles and designs that come with a higher price tag. Just like other diamond rings, prices can vary greatly, and the possibilities are endless. While most men choose to go with the traditional white or clear diamond, there are also options on colors. Diamonds can come in a variety of colors, ranging from green to orange, brown, yellow, or even blue. The pave ring setting is no different than other ring styles and the diamonds used can come in a variety of colors as well. It is up to you to decide what your bride will love the most. These pave engagement rings can be found at any jewelry store, and have become quite popular in recent years. Your jeweler can help you decide what kind of pave style you would like to choose, as well as the colors, sizes, and cut of your diamonds. Prices will vary from store to store, so be sure to shop around to find the best deal. There are several online jewelers that also sell pave style diamonds, including Emma Parking and Company at emmaparkerdiamonds.com. Another site is bluenile.com, where you can find endless possibilities for pave ring settings and where all of your questions about pave ring settings can be answered.